As Sunni militants make a major military push against the central government in Iraq, the Obama administration is said to have rebuffed requests from Prime Minister Nuri al-Maliki to carry out airstrikes at extremist bases. That reported reluctance follows years of U.S. military intervention in Iraq that many Americans say was misguided and failed to achieve its goals. 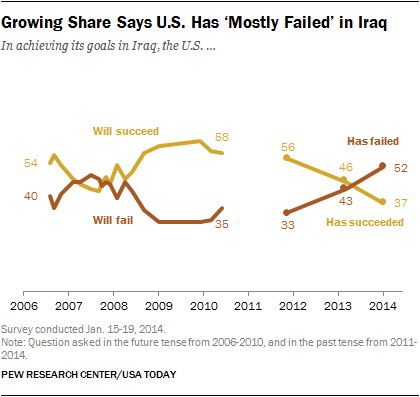 About half (52%) of Americans said the U.S. had mostly failed to achieve its goals in Iraq compared with 37% who said it had succeeded, according to a Pew Research Center survey conducted in January. That amounted to a 19-point decline in perceived success since 2011. And, by about the same margin (50% to 38%), the public said the U.S. had made the wrong decision in using military force in Iraq. This represented a shift in public opinion since the earlier years of the Iraq war. In August 2006, about three years into the conflict, Americans believed by 54% to 40% that the U.S. would succeed in achieving its goals. During that same month, Americans were almost evenly divided on whether waging the war was the right decision. When America first went to war in Iraq in March 2003 on the premise that Saddam Hussein was trying to amass chemical, biological and nuclear weapons, polls showed roughly seven-in-ten Americans backing it as the right decision. But the toppling of Hussein gave way to a grinding sectarian civil war, and American sentiment changed as U.S. forces were drawn in at a high cost, with 4,486 service members losing their lives. The share of Americans who believed U.S. military involvement in Iraq was the right decision fell steadily over the years and has fluctuated mostly below the 50% mark from February 2006 to the present. There’s little in the way of partisan differences on the subject of success in Iraq. About four-in-ten Democrats, Republicans and independents said in January this year that the U.S. had succeeded in achieving its goals in Iraq. That was a big falloff for Republicans, 68% of whom said in November 2011 that U.S. efforts had succeeded.